Exciting times. We're busy putting a program together on the catching, processing and distribution of pilchards - but first we had to find them...so I was booked aboard the Advance and over the horizon we went. Great cabin, food and company. The endless 'scuba breath' sound, beating the fish finder tempo. Nothing, so further North we went, silently creeping up on the shoal. 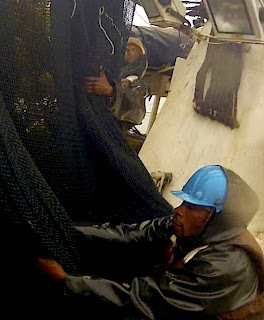 After 2 days of marking time, the sudden frenzy of all hands on deck and laying out the net, each person relying on each other to maximise the catch and get it in quickly. And me trying to get the shot and keep out the way at the same time! A long time at sea, but the footage I've got back is incredible - looking forward to the edit - so many options.